Months before the hard-fought battle for its second global headquarters in Queens, Amazon planted a massive, 855,000-square-foot flag in Staten Island. The $100 million JFK8 fulfillment center opened last fall, after an “on the spot” hiring spree, aimed at employing an eventual 2,250 people. The new factory smell still permeated the air when we visited the space in February. Things were shiny and new, but still humming. It’s a 24-hour process designed to meet the standards of rapid package delivery the company has — for better and worse — set for the entire e-commerce world. JFK8 stands as a kind of church to the world of early 21st century capitalism, and wherever you happen to land on the politics of Amazon, it’s an impressive sight to behold, as packages zip by on complex highway systems of conveyor belts, en route to next-day deliveries. The space also offers a compelling glimpse into the factories of the future, where humans and robots work hand in hand, so to speak. 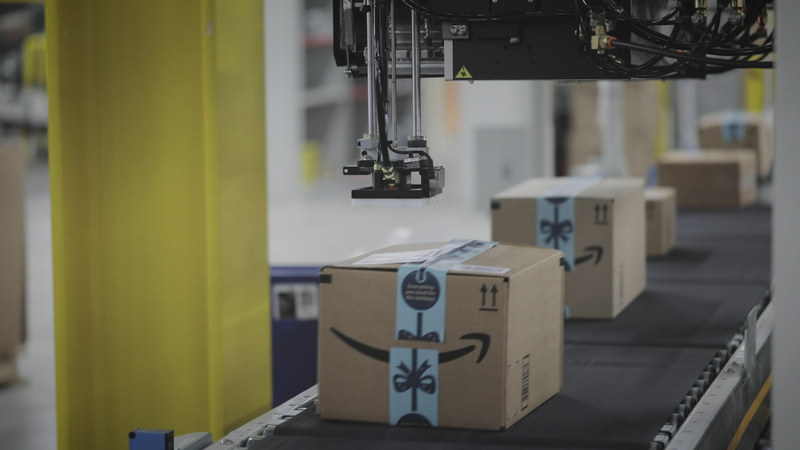 The company currently has around 100,000 robotic systems deployed across more than 25 fulfillment centers, a number that it says has helped the company store an additional 40 percent of inventory in its fulfillment centers. Those on display at the Staten Island facility run the gamut, from the ship sorters that whiz across conveyor belts booting packages into their proper chutes to giant palletizer robotic arms, developed in conjunction with Japanese automation giant, Fanuc. All are working to the same end, with Amazon’s own in-house robots forming the system’s core. Up a few flights, robots zoom around the floor in a tightly controlled space, like giant-sized Roombas in closely choreographed movements. The mobile robots were the heart of the company’s $775 million 2012 acquisition of Kiva, a Massachusetts-based startup it would rename Amazon Robotics three years later. The Kiva name still appears in some of the legacy signage, including labels that appear around the perimeter of the robot’s enclosed space, but Amazon was quick to incorporate what was at the time its second-largest acquisition. The army of robots are walled in by fences that bring to mind nothing more than indoor batting cases. 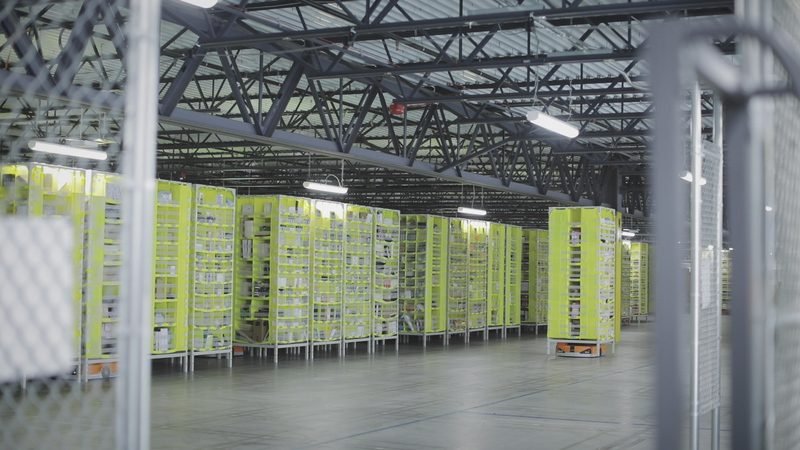 Around the edges, Amazon employees work at pick-and-stow stations, working alongside the robots to determine how best to store inventory on the shelving pods and how items will be shipped together. Dresser quickly rejects the premise that robots will outright replace their human co-workers in the short term, noting that each has a separate, but complementary skill set. Floor safety is an increasing concern. A recent story about an exploding bear mace canister that sent 24 employees to the hospital at a Robbinsville Township, New Jersey warehouse has once again brought the issue to top of mind. While the incident was initially reported to involve an Amazon robot, the company denies that any were involved. The fencing around the robots is designed specifically to keep associates out of harms way — an increasingly important concern as large machinery becomes an everyday part of life at these sorts of factories. Human employees are generally not allowed in this enclosed space for reasons of safety and efficiency, but an imperfect system requires the occasional interaction. Things fall out of pods, robots break down. It’s for this reason the company introduced the Robotic Safety Vest. 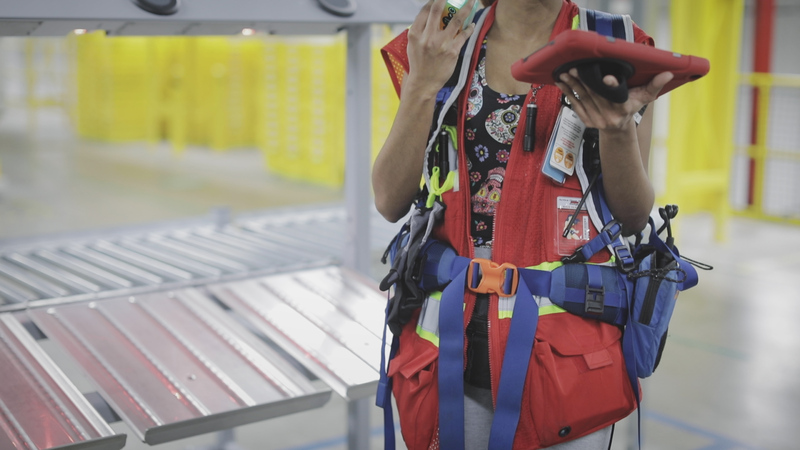 The bright orange mesh vest includes a belt containing a variety of sensors that add a few pounds to the employee’s get up. An employee demonstrates the vest, flicking a button, opening the fence and walking onto the floor. Robots at a distance slow down, while ones in the immediate vicinity stop altogether. It’s another added level of safety. If the bear mace incident showed anything, it’s how quickly news of robotics-related accidents spread, whether or not an actual robot was ultimately involved. As more people buy more products online, these armies of robotics will no doubt play an increasingly central role in meeting that demand.